Prior baking these crackers, I have never bake any savoury crackers before. This is my first time baking savoury crackers and I don't really know much about cracker baking. I wonder if most cracker recipes are the same or not... Nevertheless, this cracker recipe that I have baked for this post seems to be an interesting one to explore. This recipe was suggested by Lena, from Frozen wings from the book, William Sonoma, Essential of Baking or here for Joyce from Kitchen Flavours and I to bake-along. Interesting? 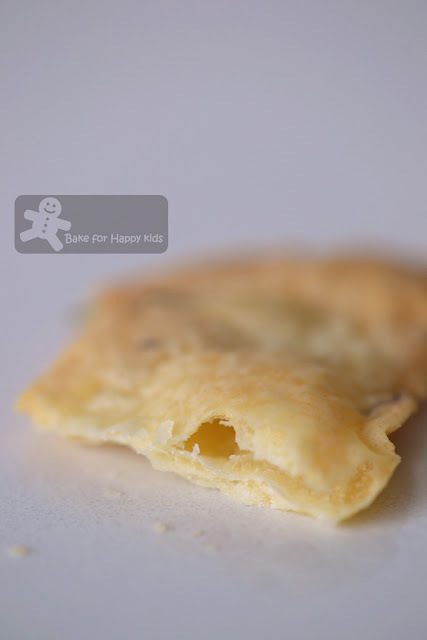 Unlike traditional pastry, cookies and biscuits recipes, this recipe contains only 1 tbsp of shortening and 1 tbsp of butter but uses heavy cream (I assume it is the 45% fat ones) to bind the cracker dough. As always, my principle for baking is always a big NO NO to shortening (because of its saturated fat content) and also less fat is always good for me... LOL! Considering the fact that less fat is always good for our hearts and waistlines, can it be bad for the taste and texture of these crackers. Is this the battle between fat vs taste?... What should I do? As I was rolling my cracker dough, I didn't know which thickness would work the best as the recipe says only "roll dough as thin as possible without tearing..." and so I rolled and rolled and rolled... hoping that my dough can be as thin as possible. It was difficult for me to roll the seeded dough as the "fat" mustard seeds embedded inside the dough resisted me from rolling further. With much persistence, I had to force, crush and flatten some mustard seeds in order to roll further and further. In contrast, it is a different story for my lemon-thyme crackers. Without the seeds, I was able to roll the dough so thin without much force and effort. 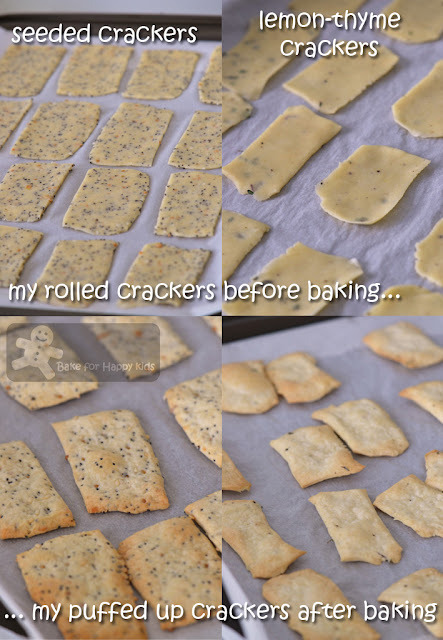 Although both doughs were equal in amount and all crackers were cut to the similar size and shapes, you can clearly see the difference knowing that I can rolled out and baked only 35 seeded crackers but 50 lemon-thyme crackers in total. Now, who wants some homemade crackers with homemade hummus? Rolling them as thin as possible are good arm exercises for me! We prefer the lemon thyme ones! To make the dough by hand, in a small bowl, stir together the flour, sugar, salt, pepper, and poppy, sesame and mustard seeds. Using a pastry blender or 2 knives, cut in the shortening and butter until the mixture forms large, coarse crumbs the size of peas. Pour in the 1/2 cup cream and mix with a fork until a rough mass forms. 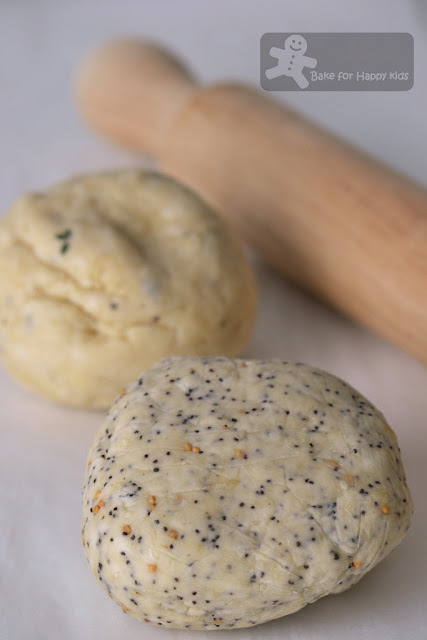 To make the dough with a food processor, in the bowl of the processor, combine the flour, sugar, salt, pepper, and poppy, sesame and mustard seeds and pulse 1 or 2 times to mix. Add the shortening and butter and pulse 7 to 10 times until the mixture forms large, coarse crumbs the size of peas. Pour in the 1/2 cup cream and pulse a few times until the dough comes together in a rough mass. Note: I have made my dough by hand. Using a plastic pastry scraper, scrape the dough out onto a clean work surface and gently squeeze it together. Add a few more drops of cream if the dough will not hold a soft shape - I need an extra 1 tbsp of cream for half of the recipe to get the dough into a soft shape. Gently press the dough into a disk, wrap it in plastic wrap, and let rest at room temperature for at least 20 mins or for up to 1 hr. Preheat an oven to 350°F (or 160°C fan forced). Line 2 half-sheet pans or rimless baking sheets with parchment paper. Unwrap the dough disk and place on a lightly floured work surface. Using a sharp knife or a bench scraper, cut the dough in half. Roll out one half of the dough into a rectangular sheet as thin as possible without tearing, dusting it with flour as needed to prevent sticking to either the work surface or the rolling pin. Trim the edges of the dough to fit the prepared pan, then carefully transfer the dough to the pan. Repeat with the second half of the dough. Alternatively, using a pizza wheel or a sharp knife, cut the sheets of dough into shapes and place on the pans. Bake 1 sheet of crackers at a time until they are crisp and brown, 12 to 15 mins (I baked mine for 13 mins). Transfer to wire racks and let cool completely until crisp. If you have baked the dough in sheets, break each sheet into shards. The crackers are best when eaten fresh, but they may be stored in an airtight container for up to 5 days. Makes about 30 small crackers. Note: Using half of the recipe, I can make 35 seeded crackers. Using another half of the recipe, I can make 50 lemon-thyme crackers. 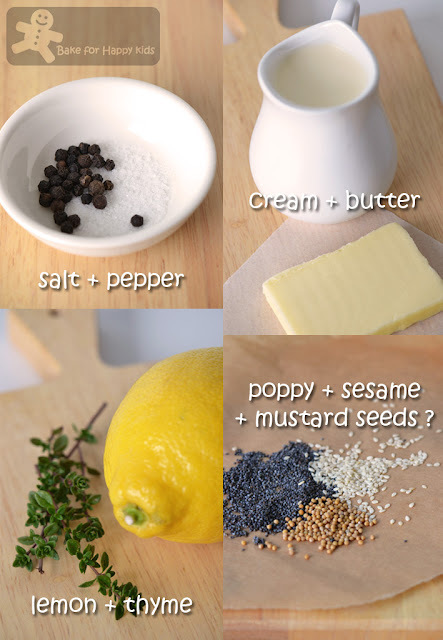 To make this variation for half amount of recipe, I have omit the poppy, sesame and mustard seeds and add the finely grated zest of 1 lemon and 1/2 tbsp chopped fresh thyme with the pepper. Transfer hummus to a bowl. 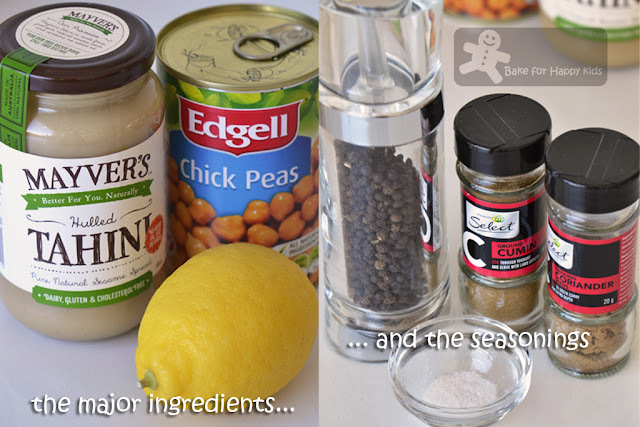 Sprinkle with paprika to garnish - I didn't do this. Serve with carrot and celery sticks or crackers. This must be a great snack for kids also adult. I love having it as my breakfast. These crackers are quite addictive! I like your lemon and thyme flavour. And making these more healthy by substituting the shortening sounds good! looks nice but I am too lazy to bake cookies, find too time consuming lol. 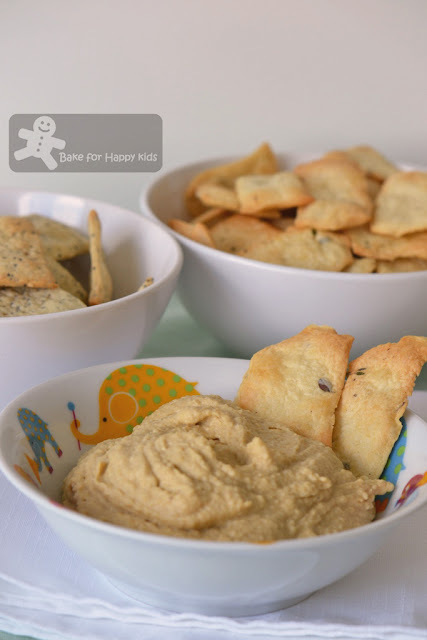 Delicious crackers and hummus, homemade is always best. I like the crispy puff crackers, looks yummy! This looks lovely. I'm not very good at making cakes, cookies and the sort but I'm inspired to try after seeing all your amazing bakes. I have never made crackers, but you've made me want to try now! These look so much better than crackers from the store! Of course, they're much healthier too! Thanks for posting! Mine's already gone despite the fact that they are too salty lol! Delicious with coffee but my son ate with a bowl of hot creamy mushroom soup! Yes, I find that the thinner you roll, the crispier the crackers! Yours look really crispy and thin! Zoe, I am very tempted to bake these crackers. I reckon after baking I will taste a piece and give away the rest so that I don't eat it all by myself. LOL! Zoe , yours is my 3rd taste test :D Both of your version look really good ! Definitely worth baking ! It is lovely to have you back Zoe. I love making my own crackers and will definitely try this recipe out for the Bake Along. Good to snack on. I have never tried making crackers. But this is real tempter. Zoe,these crackers look so delicious.It is such a good idea to make your own crackers. I have never made homemade crackers before but these sound amazing! Your crackers look extremely addictive! This crackers looks so addictive!! I love the thought of the lemon thyme crackers with the hummus what a GREAT idea!!! 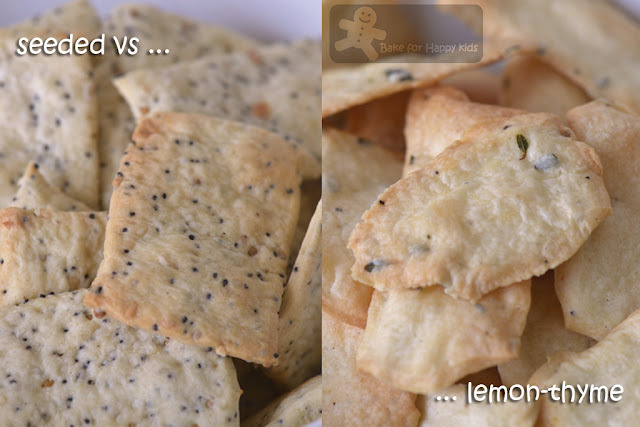 Even if I never bake crackers, ever, I will be looking for lemon crackers at the grocery just to try with hummus!!! Will be interested to attempt making my own. I wonder whether mine will be as nice as yours. I just went to Joyce's and had seen the same crackers, love this crispy crackers and will try it soon ! Crackers and hummus, am ready to invite myself to ur place anytime. hi zoe, i had no problem rolling out the dough as thin as possible too..but did you notice that the pic in the book one is even much more thinner than ours..more like potato chips..i actually like these crackers a lot..with hummus yes, that's good! I realise too that the crackers shown at william sonoma website and the book are much more thinner and hollow with lots puffiness. I reckon over-mixing the dough can reduce the puffiness of these crackers. Keeping the dough cold helps too :D You think? I've never made my own crackers before but with this amazing recipe I will! Zoe, the pictures are beautiful too. My fave snack and I love that you have given me a homemade recipe ! Thanks! These look like tasty homemade crackers! Hi Zoe, crackers and hummus sound like a great combination too! Always love reading about your kitchen experiments. My crackers always come out so thick when I bake them. I need to figure out a thin trick. Zoe, when you mentioned the salty crakers, it brought back some old memories to me when my mum liked to dip them into her kopi o. I think mum still does it now, hehe. It's a great idea to dip them into the hummus! Sorry that I have not been able to participate this event. My weekend has been mostly chaotic with another round of packing :( I have browsed through the entries for this event and set my eyes on some. Hope to try some of these recipes when I'm back from my June holidays. I bet these crackers are tasty & VERY addictive! LOVE the idea of replacing shortening with butter. This will definitely gave them a lovely rich buttery flavour! I always thought that the only substitute for shortening was margarine! I prefer butter than margarine & it does makes a difference . Lemon & thyme always a great combo! YUMMY! Those crackers look so delicious and healthy too! So inspiring! Wow, awesome bakes, Zoe! These crackers look just like they're from a branded store. R u selling them anytime soon??? Heehee! Looks super thin crispy. wonderful snack. We're starting to dabble with baking crackers, but haven't gotten very far. Great post - I learned a few things. These look terrific. Thanks so much. Hi Joe. It was a great bake along. A lot of fun and nice crackers in the end :). You have always so nice pics and the crackers look superb. I had no idea what is shortening so used also only butter. I added some buckwheat flour for the flavor, added linseeds and reduced salt. Nice to have you baking along with us. Your buckwheat crackers looks superb! Btw, shortening can be any fat that is solid at room temperature and used to make crumbly pastry. Shortening can be available in any forms and the common and less solid Crisco brand of vegetable shortening is mostly prefer to make Asian steamed buns. In Australia, the common vegetable shortening that we use is Copha and is commonly used to make rice bubbles crackles. I don't really like the idea of eating fat that is solid at room temperature. The thought of having these fat in our hearts and bodies seems extremely yucky to me. Nevertheless, under special circumstances, I'm ok to use a little of these fat. Otherwise, I will avoid this ingredient as much as I would. Glad that these crackers doesn't need any shortening to be delicious. Rolling them as thin as possible will do the trick! 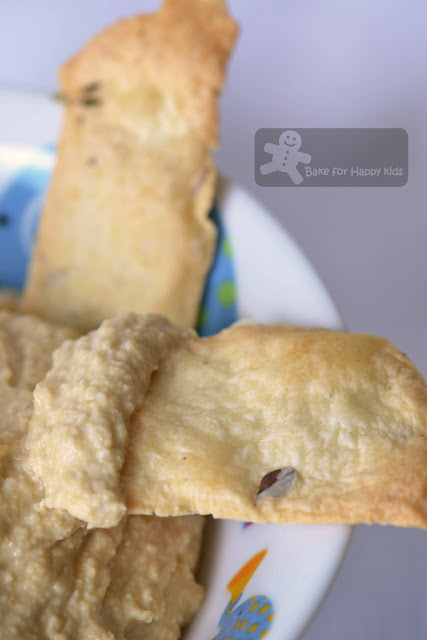 Homemade crackers with a good homemade hummus...that just rocks! Love it.